We love frame rates. We count them, measure them, and force them. High-end PC’s benchmark performance on the steadiness of frame rates. For Grid 2, it is better off without the vaunted 60fps. In fact, Grid 2 falls into a range some would find acceptable, maybe a touch below the oft considered borderline 30fps. It wouldn’t work any other way. Film runs at 24fps, with few exceptions. The level of motion is often considered “cinematic,” blurring reality and adding an unnatural edge. It is what separates our reality with the fictional one on screen. Grid 2 has those qualities. 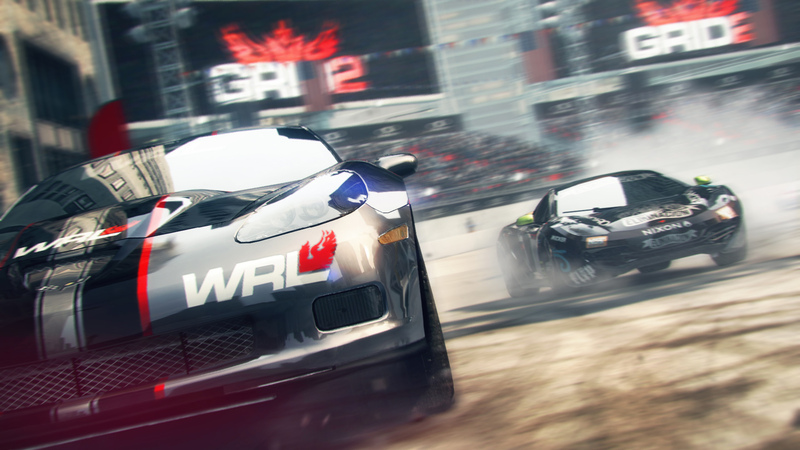 Codemasters’ relationship with cars and the racing genre is celebrated with Grid 2’s edgy, brightened contrast. It never looks real, yet is wholly spectacular. Part of that is the frame rate, chuggy by most standards, enthralling through the eyes of a cinemaphile. That combination of dazzling unreality and sacrificed frames give Codemasters’ latest a feel that has not been tried before. It is brave, but endearing. I will remember Grid 2, partly because the title is astounding in its arcade frame, but mostly because it presents its world through the virtual lens of a Hollywood camera. Looks are not centrally important. Praise Grid 2’s late generation cityscapes that swell into the skyline to set scale; the value lies at car level, where bouncing, grinding, and slamming vehicles vie for position across the globe. Stripped of its simulation aesthetic, players are freed to be sucked into this world which quickly builds its into its own ideals. Expecting developers to crank the frame rate is missing the idea entirely. Grid 2 centers around World Series Racing (WSR), an up-and-coming race league. Player’s name are scattered onto faux-ESPN websites as popularity booms. Under this banner lies a dream like quality, lens flares from headlights adorning loading screens, haunting music ambitious as it primes the next event. Into the race, it could be nothing other than wholly cinematic, a style of digital color timing and contrast applied to harden images into Hollywood spectacle. Showcase those same images at 60fps, and the unreality of the contest is lost. For once, we can praise “choppiness.” That’s refreshing.